I love being southern. Some would argue that Tennessee is truly not a southern state, but if you live here you know you are southern. I love knowing how to properly set a place setting (Emily Post would be proud! ), I know what manners are, and I know what “bless her heart” really means. Sweet tea and a good cup of coffee are my go-to drinks, and I can hardly turn down banana pudding, red velvet cake, or pralines. When I design weddings somehow the southern me creeps in. I just have to use my grandmothers cut crystal in that place setting. That wont be complete without a long tailed bow. You have to have the bread and butter plate with that china. 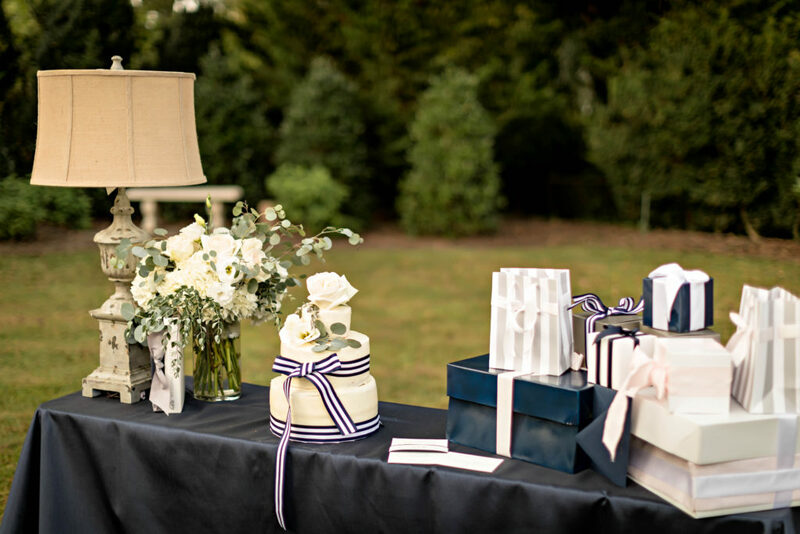 I have seen lots of southern touches became national wedding trends; monograms, pies and desserts beyond tiered wedding cake; big floral prints just to name a few. So I thought it would be fun to take as many things southern as possible and squeeze them all into one wedding. First I selected the setting. In the south we love using historic feeling locations. 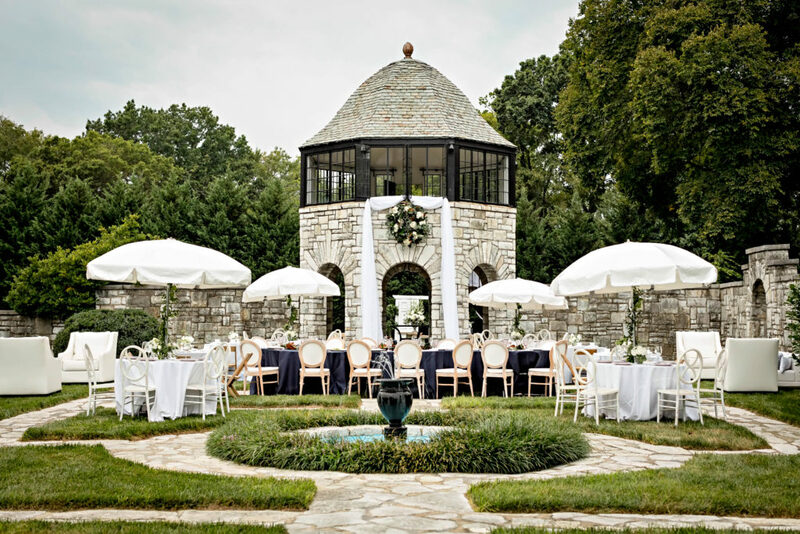 The tower was the perfect setting for a big ole southern weddin’. I then took what had become popular with brides and altered it. Lets start with the ceremony, shall we…. Lately in wedding world we have seen many, many sets of doors. As a guest you have probably walked thru several as you enter your friends wedding. 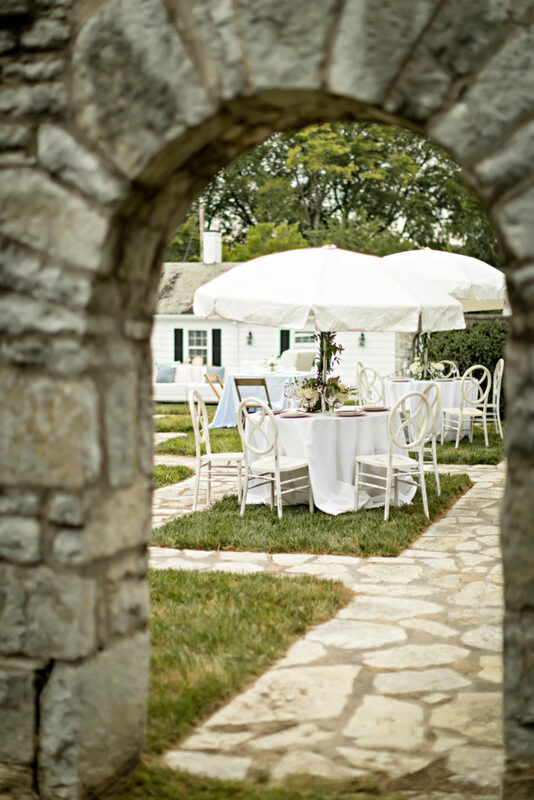 Some brides have used this elements as a doorway into the wedding environment. 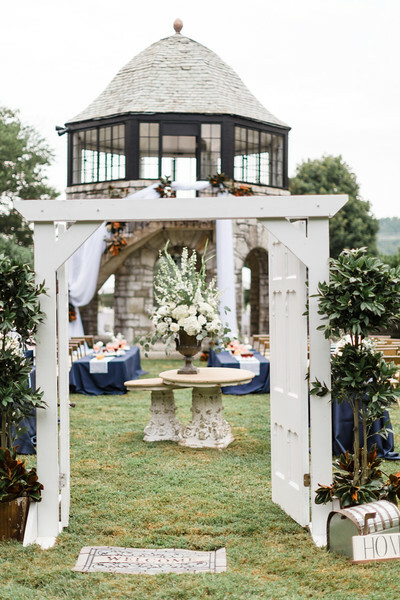 Some have used it as a backdrop to their ceremony symbolizing the doorway into their marriage. I used a set of doors to represent what we do best in the south, a welcome to our home symbol. In the South front doors are important. 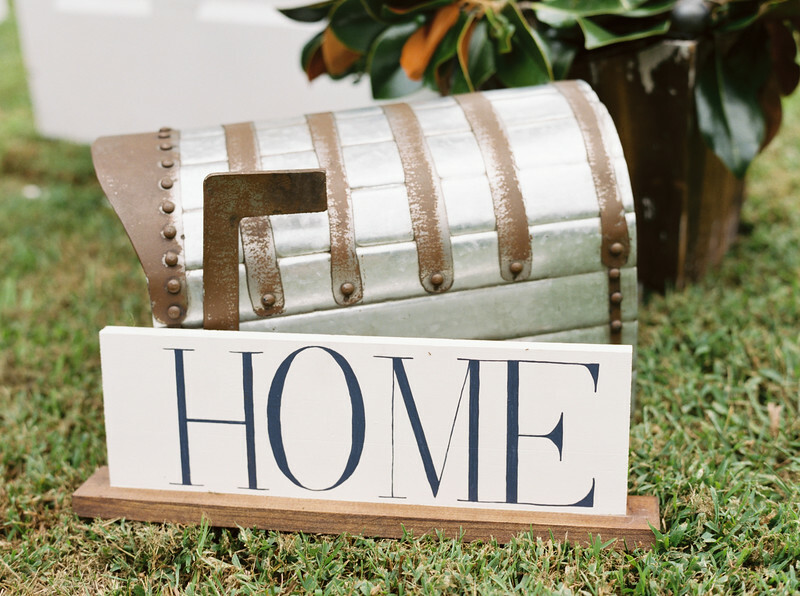 They make a statement to a house, and it is the first thing to welcome your guests to your home. With this in mind I wanted the doors and entryway into the ceremony to represent that of a good southern home. We have a set of doors that were styled with a hand painted home sign, a mailbox, finished with magnolia trees on either side. As guests enter pass thru the door way, I wanted to guests to be welcomed with pieces as they would be in a big southern plantation; a big foyer table filled with fresh flowers and 2 sideboard tables styled with wedding items and home items including: a space for gifts and guest book; flower girl basket; a simple cake; my grandmothers tea set; vintage lamps, and no home is complete without fresh flowers, courtesy of Samuel Franklin Florist. After the ceremony the guests would move under the tower, and enter into a breath of fresh air reception anchored with a navy head table. I chose the color scheme of Navy to represent the nautical style you always see in Charleston (no pineapples please); keep the blush and bashful of it all, and of course you have to have your something blue. I wanted it to feel breezy, careless, but southern strong. 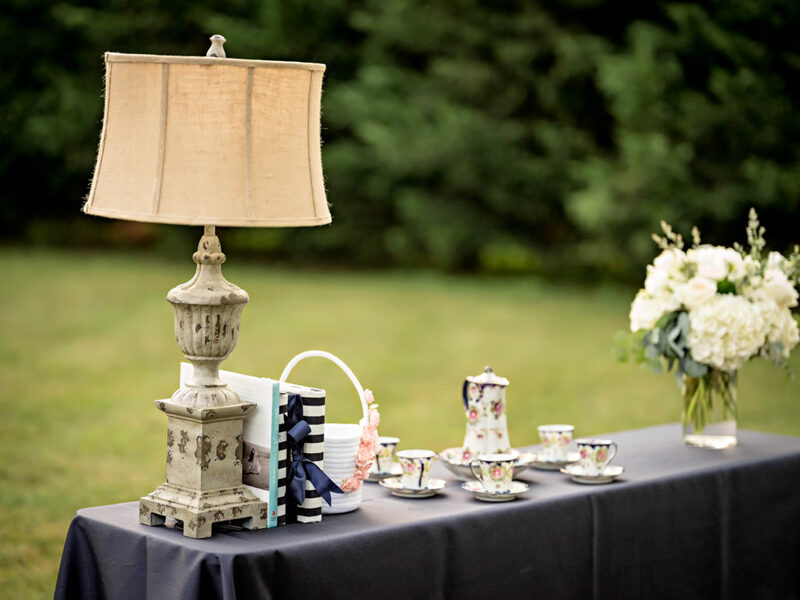 I used simple linens, with an array of china, and mixed patterns. 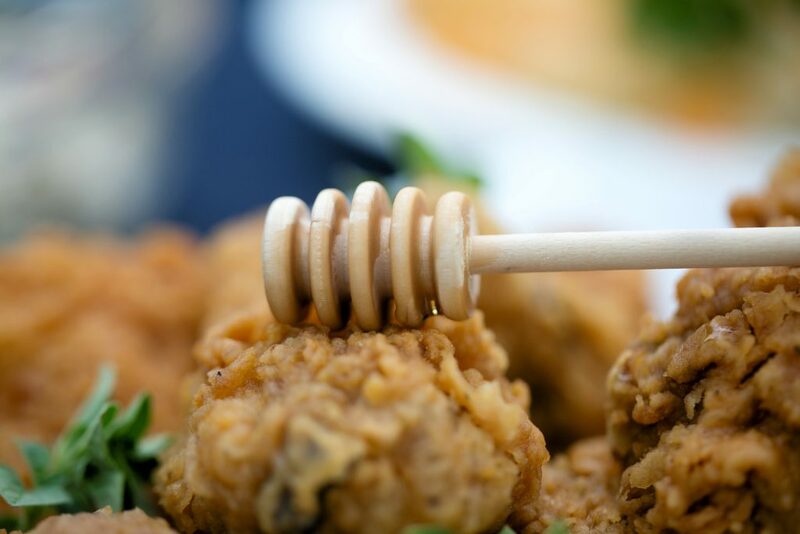 I kept thinking of the perfect spring day in the south with sweet tea, lemonade, and bourbon. 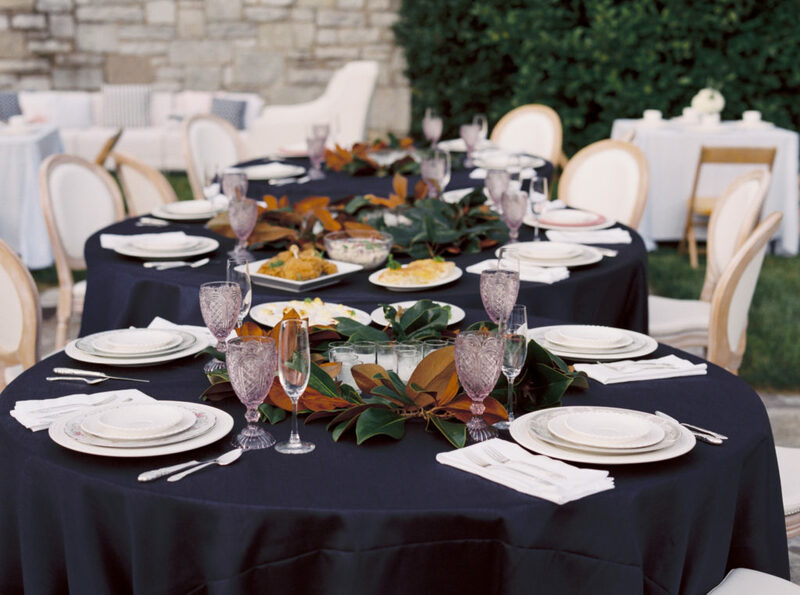 This head table is meant to host the wedding party, or family. Just using a solid bold navy main this table the focal point. Of course I brought in the southern elements to each place setting. 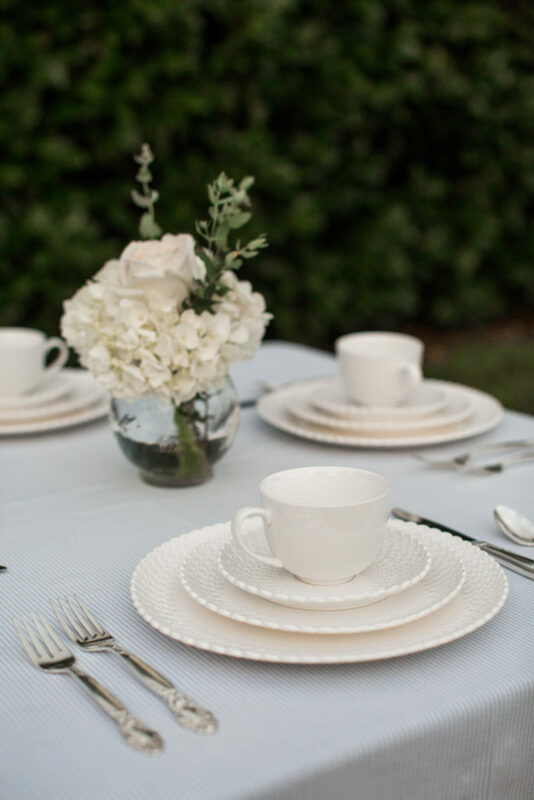 I chose to style each place setting with new and old china. A friend of mine received china from both her grandmothers, both her and her husbands mother. She never knew who’s to use and for what occasion. 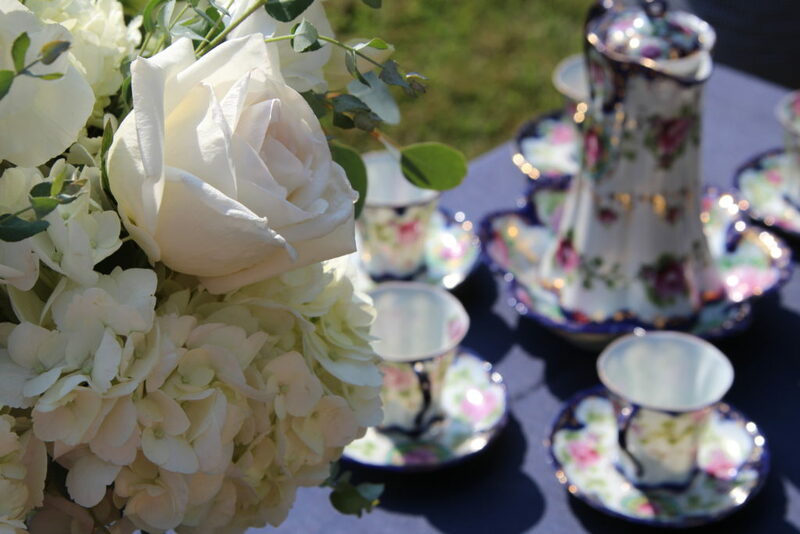 Plus she had received her own china pattern that was so modern compared to her heirloom china. 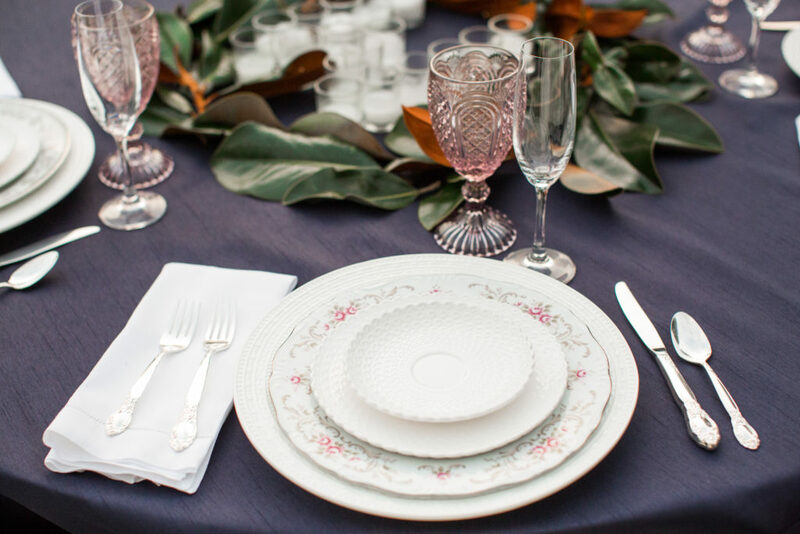 It reminded me of the saying “something old, something new.” So I took what some might struggle with; mixed new rented china from All Occasion Party Rentals with older china patterns by Unique Place Settings Knoxville Each place setting with a traditional style flatware, and blush goblets for a little touch. Classic Southern centerpiece of magnolia leaves, but with a candle monogram in the center of all the magnolia by Samuel Franklin Florist. Every Southern lady has at least one thing monogrammed, right? 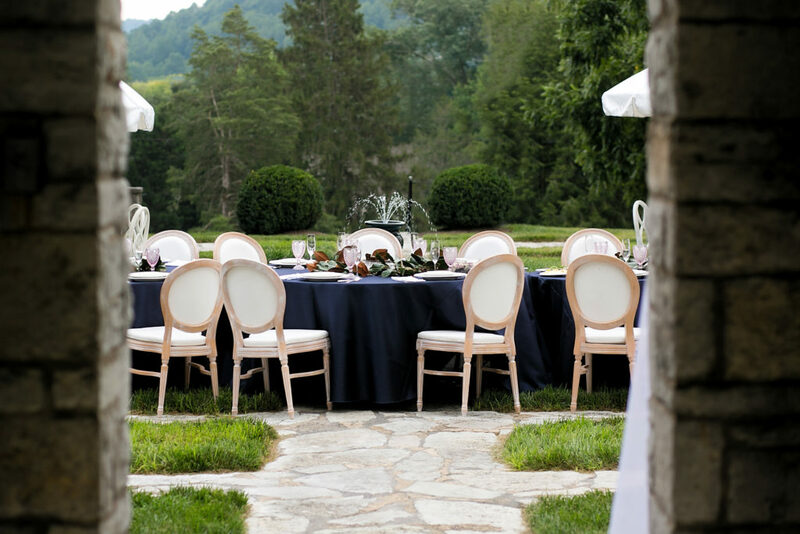 Other tables to host guests were styled with my favorite southern fabric, seersucker! You cant get more Southern than seersucker! Then to add to the environment and really create a classy party atmosphere I chose to use 4 umbrella tables and some accent couches. Some find the umbrella type of tables dated, but if used correctly they can really make a statement. I didn’t want to overload these tables, and take away focus from the head table. 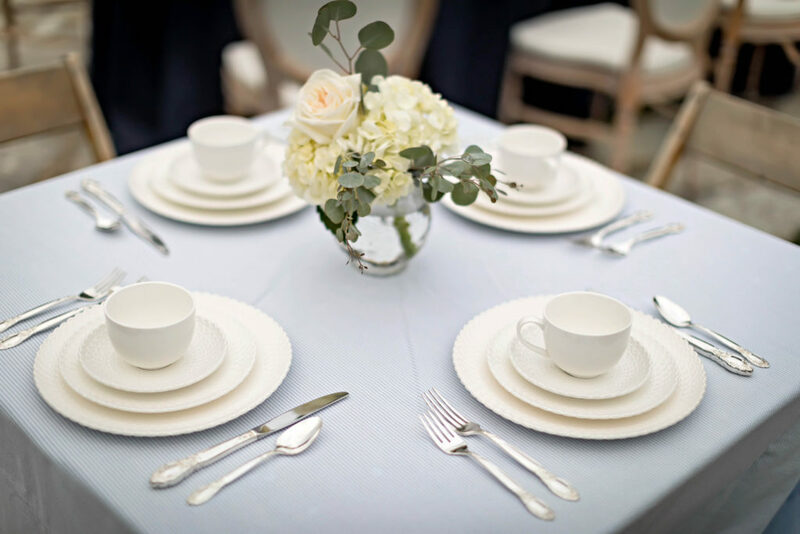 So, simple white linens, blush chargers with vintage china, simple glassware. 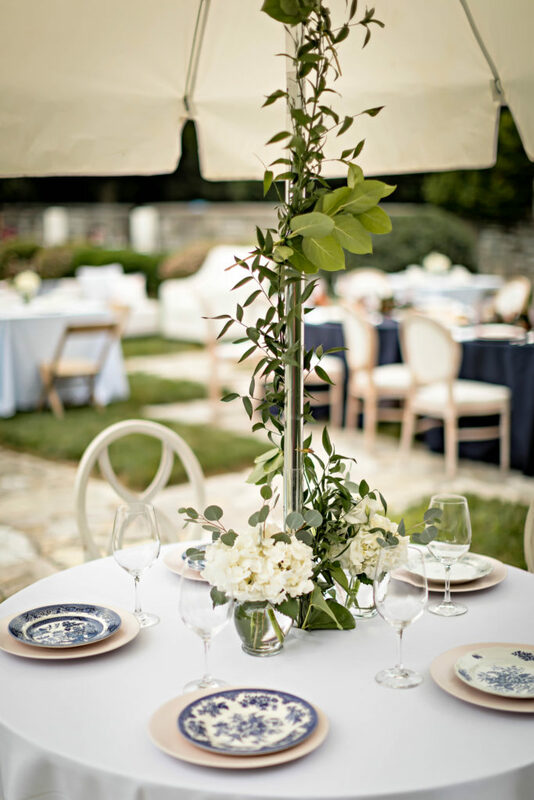 The finishing touch was creeping vine up the center poles with hydrangea blooms. I adored putting this together. I think I made by mama, my Nan, and my Topsie all proud. 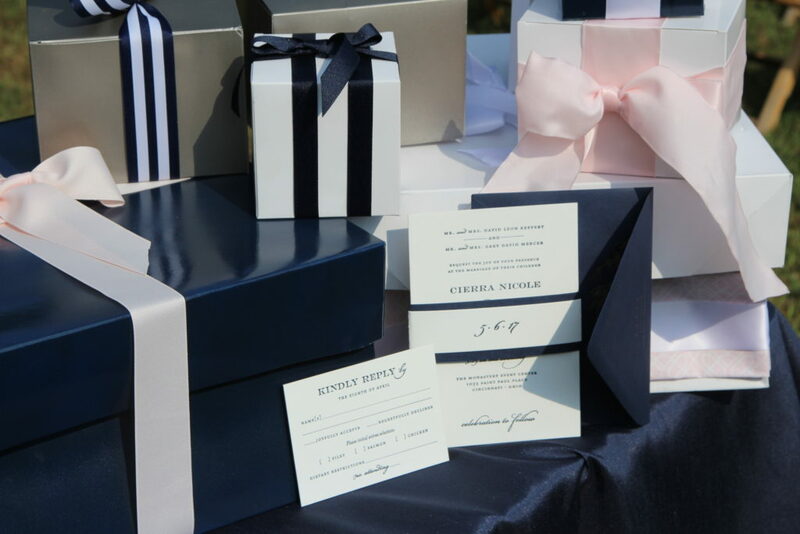 I hope Shelby and Jackson ight like it for their own wedding. Its a wedding that could have been accomplished in 1950 and still be modern enough for today. 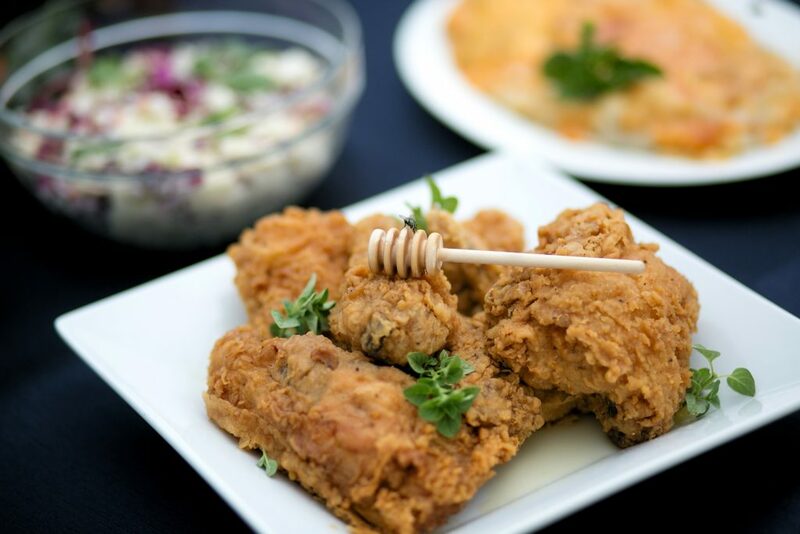 Here in the South we love a good party, but we do it with class, a smile, and some good fried chicken.